We’re in the asparagus patch on a warm, windy day in February. There’s not much to see but last year’s dead growth. Not much, that is, except these bright-red berries. Ugh! Obviously, I am gardening with the best person in the family. That is awesome! I’ve not seen baby asparagus plants before. That is my wife’s plan: start asparagus from seeds now instead of buying roots next year. What do you think about that? Ed, that’s a great question. There are varieties (Jersey King is one) that are all male plants, so they don’t bother going to seed and supposedly you get to eat all the sprouts yourself. In fact there’s a lot of literature that says if your asparagus plants throw berries, then you should throw away the plant. Me, well, obviously I like having the girls around! And of course there’s no guarantee that the four little plants we have growing under the lights are gonna be boys. So I say seeds are a cheap way to get plants, especially if they’re from your own crop: they’ve acclimated to your conditions. Strawberries, though: now there’s a crop that’s supposedly great to grow from seeds. Any interest there? Maybe we should ask Sylvie. Found your blog a couple of weeks ago and have had a blast reading. Are you growing artichokes as annuals or have you found a variety that will winter over? They are such beautiful plants or at least the ones I saw once in California were. Since we have lots of wild asparagus, I randomly take the plants and scatter the seeds in places I want more. Makes for great eating after about three years. Good for you and your daughter! I was just checking out our little aspargus seedlings a moment ago too. They’re only about 1 1/2 tall, but they do look like asparagus already! I find it exciting too….especially b’c I didn’t label everything…oops! Have you planted peas yet? Yes, stick with your gardening partner; keep the other one for heavy lifting. Lots of people don’t know what asparagus looks like when its leafed out- so actually its often a misidentified plant. since you ask. El: Alpine strawberries are great to grow from seeds. In fact, that’s how I am increasing my Fraises des Bois, since it takes a LOT of plants to get a decent bowl of strawberries, let alone enough to make sorbet! If you got the time and like to grow from seeds, go for it! I have not tried other strawberries from seeds, but there is no reason why you can’t: it’s just that “regular” strawberries are so easy to propagate by runners, that most people much rather eat the seeds along with the fruit! I am so curious. When you plant a fruit tree, the conventional wisdom is to not allow the tree to go to fruit in order to allow a stronger root system. Why isn’t it the same for asparagus? 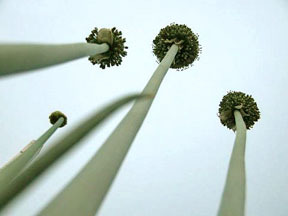 We are told we must let asparagus flower and go to seed in order to build stronger roots. When our family moved into our new house in 1969 we were on a dirt road and our house was in a new subdivision on a fomer dairy farm.Across the road was an old railroad right of way and between that and a farm field next to it each spring Asparagus grew.Thankfully for us our new neighbor was a country boy and knew what it looked like when it first sprouted.I Some of the best I ever had because of how we got it but it was really tasty also. Asparagus takes a couple years to bear food, right? And it keeps coming back? Or am I thinking of something else? I love the tiny asparagus in early summer. Christy, yep, tipping over in cuteness here! Hi Ed. I think all ways are the best ways to get more of a diversified harvest. Aw Janis, thanks! Actually, I have had spotty luck with the artichokes overwintering here. I plant new every other year it seems; they’re really just a lark and not really a big-harvest plant. They might have more luck in the greenhouse this year and so that’s where the new seeds are destined to stay. But I do agree they’re quite beautiful plants. Ours are Green Globe. Linda, that is also a great idea. I have discovered almost no difference between mine and the wild harvests we make yearly. In fact, those wildlings tend to be bigger if we get them before the deer do. Lindsay, yay! Glad to hear the coldframes are working and I am likewise glad to know we’re not the only Michiganders sowing asparagus seed. Isn’t it fun? I did plant my peas but they’re no-shows so far outside. In the greenhouse they’re growing quite well. Dakota, hmm. I guess I have no clue if mine are hybrid or not; I assume not but who knows. Yeah, as far as research on this one plant goes, I suppose it makes a lot of sense to spend some time on it. Me, I spent no time and just planted the things! 15 years is a long time to have a plant in the ground and heck most folks nowadays move 2 times in that span of years. Pamela, exactly. Actually he does do his fair share of lifting (heavy or no) and I guess I can’t help him out with that curiosity thing re: green growing things. It’s just as well because this way it’s all, er, MINE (she says greedily). EJ, yep! I remember pointing out to a knowledgeable friend some brown fronds of the plant when we were on a Minnesota hike. “You are kidding me,” he said. “It probably tastes horrible.” Oh what little he knew. Sylvie, we might have to do a seed trade then. I have put off (for a long time) doing strawberries because I HATE weeding them (that was one of my childhood tasks). I know the alpines taste so darned good. We have tons of wild ones growing in the wooded part of the property but it takes about an hour for the 3 of us to harvest about 4 cups (but then again maybe if we didn’t eat as we picked it might grow faster). Liz, great question that only the Sages of Fruit Production would be able to answer. Me, I am still a hobbyist in the world of things like fruit trees and perennial veg. All I know is I didn’t do the best job planting the asparagus 5 springs ago but that didn’t seem to make much of a difference…and of course we picked them when we “shouldn’t have.” In point of fact I had to raise the lock on the garden gate so the child wouldn’t go in there and harvest them all! True story! John, isn’t that the truth? Both morels and asparagus grow along the highways here: you just need eyes to see them. I can’t tell you how many times people have stopped to see if we were having car trouble when all we were really doing is foraging free grub! MC, yep, it’s perennial, and some rootstock lasts 20 years or more. You’re supposed to plant it and wait 3 years for the stuff to acclimate. But yeah we were surprised there was no seed leaf and I guess it’s all just a little bit of a gift when things break through the soil! Sylvie, it’s great to cultivate their natural curiosity. Keeps me thinking too!